Bunk beds represent an excellent space-saving solution for those with big families or if you need a more spacious bedding option for guests. This type of bed is very popular and in recent times the manufacturing methods have advanced to a point where bunk beds are more stable and durable than ever. Matching the specific décor in your room can be done without too much hassle as bunk beds manufacturers offer their products with a good range of materials and colors. Paired with fitting mattresses, a bunk bed could be an attractive bedding solution for many, particularly for those with multiple children. You might also be interested in our articles about the best massage chairs and the best futons. The market for bunk beds can be overwhelming when you consider the different designs and construction approaches. Some popular types of bunk beds are twin over twin and full over full. The first is one very commonly sought as it’s ideal for children while the second is great for those who want larger beds. 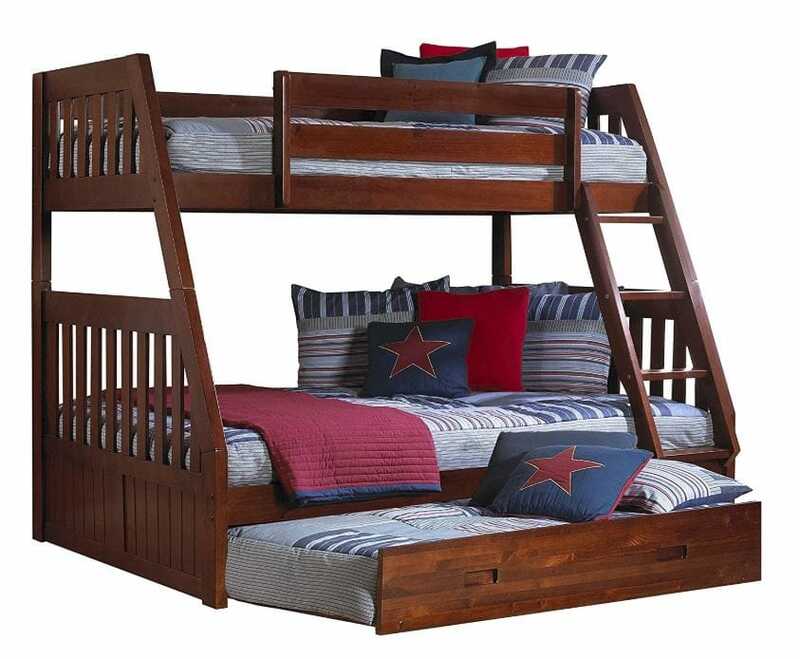 Other popular additions for bunk beds are separate stairs, trundles, and dedicated shelves or drawers. If you’re finally decided that it’s time to make the investment in a great bunk bed model, there are a few considerations to keep in mind. The most common materials used in the construction of bunk beds are metal and wood. Wood is definitely the more attractive option giving off a much more pleasant feeling to the room compared to metal beds that seem cheap by comparison. There are some qualities worth considering in metal beds which could make it the superior choice over wood. If weight is a concern, it’s important to note that bunk beds made of metal are more lightweight. They are also more compact and durable compared to wood beds. The ladder is an important component of any bunk bed because you need it for top bunk access. There’s a good variety of options to choose from when it comes to ladders. Some models provide dual purpose ladders while the large majority of bunk beds are equipped with classic straight up/down ladders. If you favor some extra flexibility, you can pick a model with a ladder that can be mounted in different ways. Some people like having a trundle bed to accommodate an extra guest if needed. Even if you don’t require an extra sleeping space, it can still be useful to make use of that space to store various items. Other solid options for storage include stairway drawers. This can be convenient to have as you’ll be able to do a more efficient organization. Expect to spend more for these extra features, but a larger investment can be a smarter one in most cases. Now that you’re better informed regarding the essential features of bunk beds, you’re ready to go shopping for a reliable model. To cut down on your research time, we’ll present you the best options available. It doesn’t matter how small or big your budget is, there should be a high-quality model for your specific needs in here. One of the best offers for a quality bunk bed comes from DHP. Their Twin-Over-Full metal model delivers some excellent features for its cost. It’s intended for those who wish to get their hands on a sturdy, utilitarian bunk bed style which doesn’t come with any frills, but it does the job well. The most important aspect for most people shopping for a bunk bed is probably saving some space in their rooms. Whether for children or guests, this bunk bed seems like a solid option considering the lightweight and compact design which allows you to easily place it anywhere you need. With the right mattresses, this bunk bed has some great potential when it comes to comfort. 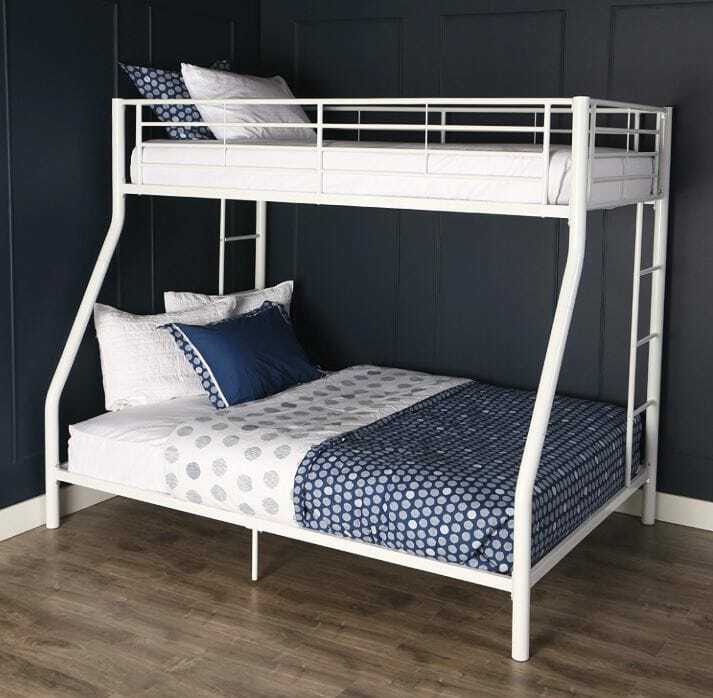 As this is a Twin-Over-Full type of bunk bed, it will require a top mattress with a height of up to 6” while the one on the bottom shouldn’t go over 8” maximum thickness. There are three available colors to suit the look of your room – black, silver, and white. The bunk bed can accommodate children as well as adults. There’s a weight limit of 200 pounds for the top bed while the full bed underneath can manage two persons easily with its 400 pounds limit. When it comes to ladders, there are two side ones provided and they’re both neatly integrated into the frame of the whole construction. Safety and support are part of any reliable bunk bed design. This model features metal slats on both beds to ensure a durable experience. Everything comes in one package and is not particularly difficult to assemble. There are some stages that can be more easily done with the help of another person. 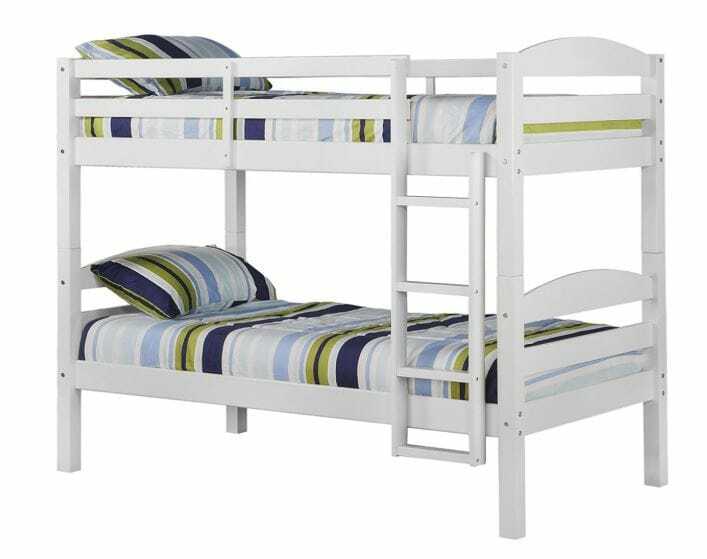 Taking into account the cost, the DHP Twin-Over-Full is an excellent bunk bed to consider. Everything from the decent construction quality to the simple set-up makes this a solid winner on the market for bunk beds. The looks may not be too impressive for some, but those who value more functionality in their bunk beds won’t be disappointed. 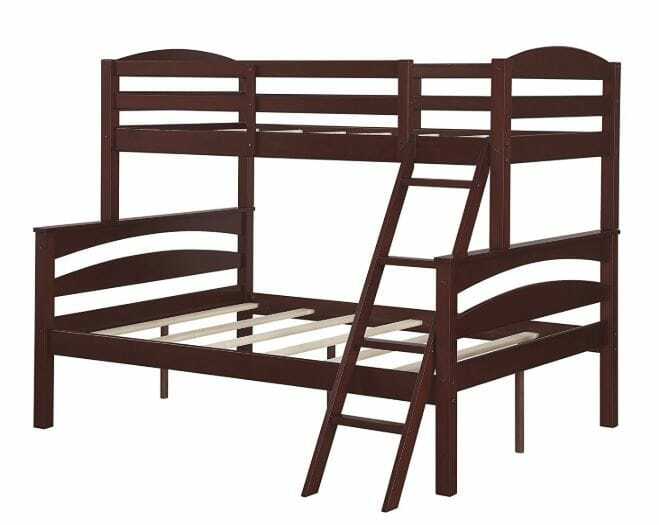 The Storkcraft Caribou is a fairly small but highly attractive bunk bed that comes in different color flavors. The model in this review is the one with a white finish. Other options are gray and espresso. There are many aspects that seem exciting regarding this model including the versatility and high safety standards. Whether for toddlers or children, this is a perfectly-sized bunk bed whose main attraction point is definitely the design. It’s manufactured using solid rubberwood and composites which represents a step above metal models. The high-quality construction can also be reflected in the price which is higher than metal units. Versatility is a key feature for a bunk bed. This is a model that gets things right in that regard. You can configure it into separate beds apart from its usual bunk bed functionality. As this is a twin bunk bed, it won’t occupy too much space in your room, offering just enough to accommodate your children. Assembling a bunk bed like this one can get a little difficult during certain stages. Having poor instructions can make the whole experience very frustrating. Thankfully, this bunk bed provides a free app which helps to visualize the entire project better. Through the BLT app, you can gain access to quick and effective 3D assembly instructions. Like any other bunk bed on the market, this one also comes with a ladder equipped with four steps. It feels well built and it looks like the manufacturer doesn’t compromise on safety and durability. There are full-length guardrails installed for the top bed to prevent accidents and top-quality fastening systems complete the whole construction. Another thing worth mentioning is the fact that important safety standards such as CPSC and ASTM are fully met by this bunk bed. All in all, the Storkcraft Caribou could be the ideal bunk for you if you need a space-saving solution for your toddlers or children. Paired with the right mattress can be very comfortable and will look excellent in any modern décor thanks to the beautiful wood finish. A great buy for a bunk bed. A reasonably-priced bunk bed for children and adults alike is the Twin-Over-Twin from Walker Edison. Crafted out of powder-coat steel with a sturdy ladder, this looks like it can finally solve your bedding issues if you’re short for space. The cost is not very high as this is a metal unit, but don’t be deceived because the quality level won’t let you down. The design of this bunk bed has a modern appeal. A metal construction can be quite stylish if you pay attention to correctly integrating it with the rest of the room’s décor. By choosing a metal model like this you can have some solid benefits like the increased durability. 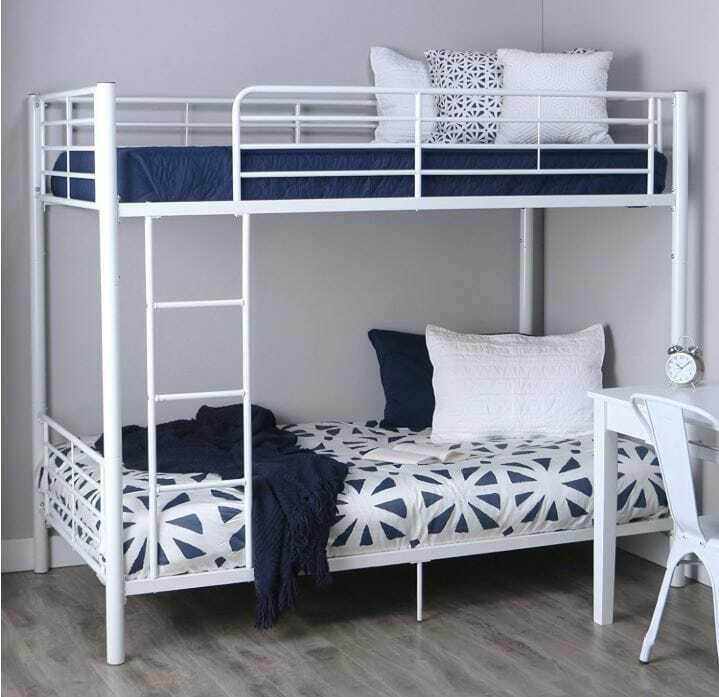 The blend of tubular steel framing with a neat and efficient geometric style makes this a surprisingly good-looking bunk bed. The powder coating has been added to enhance the durability of the construction even further. It’s worth pointing out that there’s no lead used in the process. As mentioned earlier, this bed suits kids very well, but thanks to a 250 lbs. weight limit, can be used with adults without issues. If you’re worried about the beds being too close, there’s a 43.5 inches clearance between them enabling a more comfortable experience. To go the top bunk, you need to use the ladder which can be attached on both ends for more flexibility. 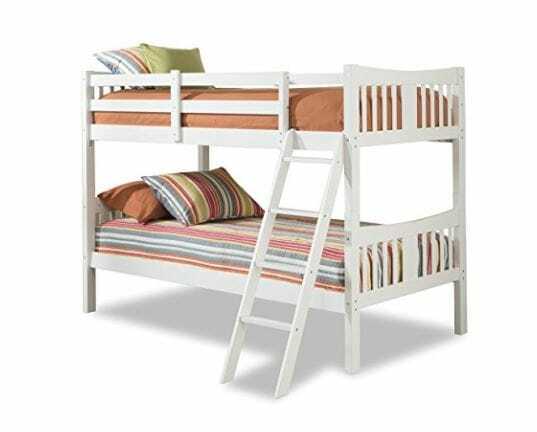 In terms of safety, the bunk bed comes with guardrails for the full length of the top bed. They’re also taller than similarly featured models with a 15 inches height to ensure the best protection. An ideal mattress for this bunk bed shouldn’t go over 9 inches. When there’s a need for more personal space or if, for some reason, you wish to separate the beds, this bunk beds permits exactly that. It can be converted to two twin beds in no time. Keep the guardrails on if you have toddlers. With so many great features and considering the price bracket, the Walker Edison Twin-Over-Twin could be an excellent addition to any small room. This unit’s proof that metal bunk beds still deserve a chance if you wish to get a compact, durable and decent-looking bedding solution. For those who want to spend a little extra on truly stylish bunk beds for their kids, the Dorel Living Brady Twin-Over-Full should be at the top of their list of options. This well-crafted bunk bed made of high-quality wood comes with an elegant espresso finish. Black, graphite, gray, and white versions are also available. Offering your kids the best level of comfort is clearly a strong desire for any parent. With the help of this bunk bed, you can provide precisely that. This is a highly versatile bunk bed which can save some generous space in the room. In some cases, it can be preferable to have them converted into separate beds – one full and one twin. This is managed without too much hassle. The construction of this bunk bed is one of the main highlights. As opposed to other similar wood models that also rely on composites, this one packs an all wooden design. It looks extremely fitting in any modern room, and the design is very practical to maximize the play area of your children. Besides a robust wood construction, this bunk bed has some capable safety features. An upper guardrail will prevent any accidents for the top bed. Reaching there is done using a 4-step angled ladder which doesn’t feel flimsy like some other models out there. Assembling this unit can take a while, but the process has been simplified by the fact that all the required items come in the package. Support slats are provided for both beds and this translates to no longer needing box springs for the mattresses. All things considered, the Dorel Living Brady Twin-Over-Full is a very high-quality option for a bunk bed intended for children. They’re sturdy enough to handle adults too, but the beds work best for kids. The design is stylish and construction elements are well thought-out, so overall this bunk bed deserves a spot on this list. It’s actually a bargain for what it offers. If your room is small and you realize that using two beds side by side will sacrifice too much space, there’s hardly a better choice than going for a reliable bunk bed like the WE Furniture Twin model. It boasts great versatility, decent safety features, and a solid wood construction that’s not restricted to just a few colors. Take your pick from black and white to espresso, cherry, natural, or grey. Having a compact footprint is an essential feature of any bunk bed but in the case of this model that’s even more noticeable as it’s a twin type. It’s manufactured with solid pine wood giving off a traditional feeling in terms of looks. The right mix of sturdiness and style. Some of the most interesting features provided by this bed are the guardrails installed for the top bed and the ladder which can be easily switched from one end to another. The bunk bed can be configured in twin independent beds for those times when the available space permits better accommodation for two separate beds. In the package for this bunk bed, you will discover that your assembling job is greatly simplified with the help of intuitive step-by-step instructions. Mattresses won’t require box springs thanks to the addition of supports slats. Whether foam or classic coil spring mattresses, this bed supports well whatever you choose. Just make sure you don’t go over the top with the thickness of the mattress on the top bunk. Decent for children and adults alike, the WE Furniture Twin bunk bed should finally resolve your bedding problems if you need to furnish a smaller room. The craftsmanship is solid for the cost and the multiple color options can be helpful when you need to decide on the best look for your décor. All in all, this is a highly recommended all-around bunk bed. A premium option for a quality bunk bed for adults is the Coaster Home Furnishings 460078. Those who require a more compact bedding solution will definitely appreciate the gunmetal look of this model. It’s a full-over-full type so it can easily accommodate multiple guests. With a maximum weight limit of 400 pounds for each bed, this is definitely a sturdy bunk bed. It has a stylish curved design offering convenient bilateral ladders which come fully integrated into the whole metal construction. This is a bed for those who favor durability above all else as it’s built using 2-inch metal tubing. The bunk bed is spacious and capable enough to sustain more people. Its dark gunmetal finish should attract some attention in your home. The design can fit well in any home with a modern décor. It should suit nicely even your children’s’ or teenagers’ room. The choice of metal over wood can be a smarter one and not just because of the superior durability. You can also say goodbye to that annoying squeaking that often happens with wooden models. 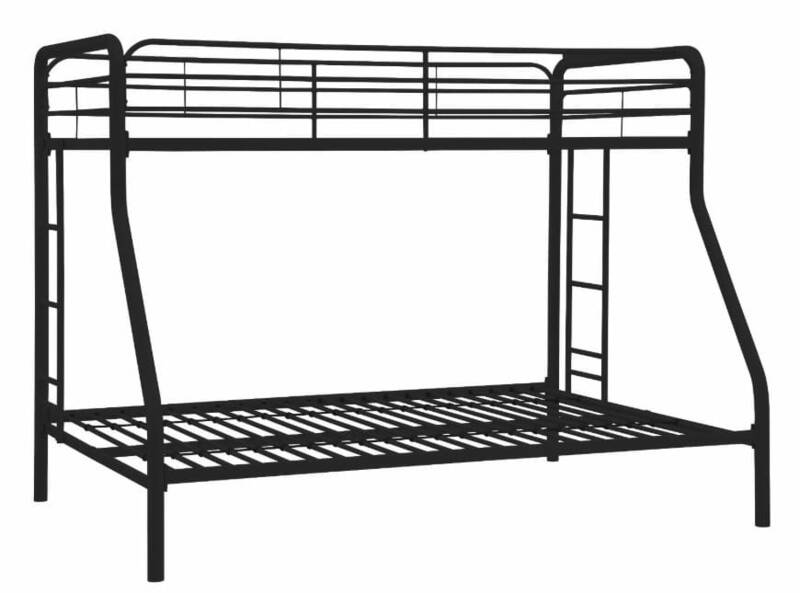 When it comes to safety, the bunk bed offers full-length guardrails at the top. There’s no need for a Bunkie board as the manufacturer provides a slat kit. One disadvantage regarding this bunk bed is that it’s not as flexible. You can’t make two standalone beds from this bunk bed as the design doesn’t permit this configuration. Sturdy and compact, the Coaster Home Furnishings 460078 can create a great sleeping experience without making the room feel too crowded. The design looks fun and it’s very practical. You have some work to do when assembling the bunk bed, but it pays off in the end. This model is probably the strongest bunk bed money can buy, so if that’s what you’re looking for, you can rest assured that you won’t be disappointed. A very high-quality option for a bunk bed is this Twin-over-Full model from Discovery World Furniture. It’s elegantly designed and very spacious considering the addition of a twin size trundle underneath the bottom bed. This looks like a considerable investment, so let’s see if the bunk bed is worth the money. One of the most appealing features of this model is the contemporary design which has just a touch of a traditional feeling. The solid wood construction is available in different colors – merlot, espresso, and honey. The bottom bunk is a full bed while the one on the top is a twin-sized one. A trundle bed can have many benefits so it’s great to see one included here. Keep in mind that you should purchase a thinner mattress for the trundle compared to the rest of the beds as it won’t fit well otherwise. Some good mattress heights for the top and bottom bunks would be around 8 inches. There are guardrails located on each side of the top bed, so you should be safe when sleeping there. A ladder has been conveniently placed to gain access to the upper bed. This model is mattress ready as it comes complete with a slat kit making it no longer required to purchase a box spring. Having a bunk bed is great to save space, but there can be times when you need to have two separate beds. These bunk beds are fully convertible to independent twin beds. The manufacturer has taken extra precautions to ensure the complete safety of their beds and this unit respects ASTM and CPSC regulations. Using the provided directions you can have a reliable bunk bed quite fast. Overall, the Discovery World Furniture Twin-Over-Full deserves a spot on this list considering the decent set of features for its price. If you want extra quality though, you should be prepared to spend a little more so this is a fine investment. 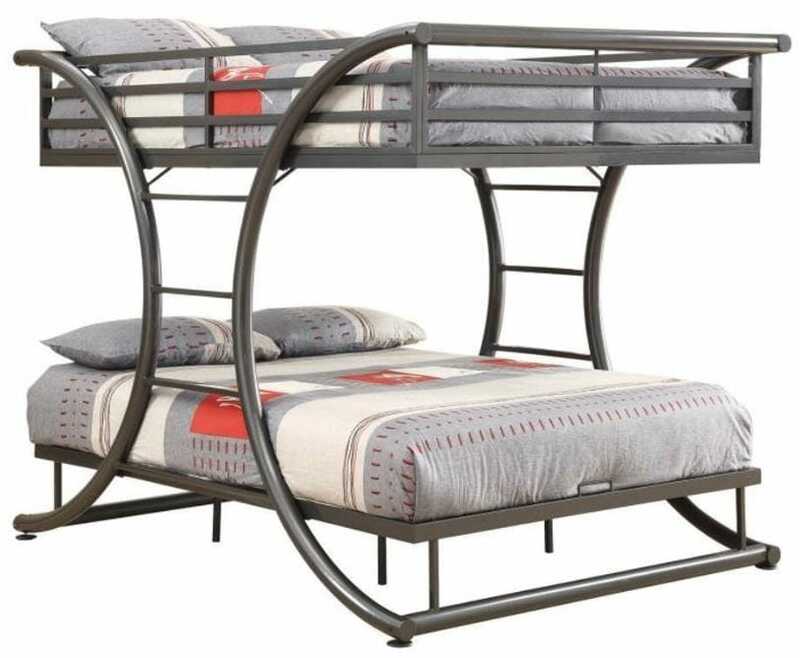 The last model from Walker Edison to consider is their Twin-Over-Full bunk bed. Available in both black and white colors, this is a nicely finished metal model adequate for a wide range of home environments. Ideal for children, but it can be a solid option for adults too as each bunk handles a maximum weight of 250 pounds. As the bunk bed is constructed to accommodate both a twin and full-size mattress, it could be a good solution for those in need of better space management. Two integrated ladders are available for reaching the top bed with ease. The bunk bed’s frame is made of solid steel which gives it a sense of durability you can count on. A smooth powder-coat texture contributes to the durable feeling of the metal frame. Each bunk comes with support slats removing the requirement of box springs. Safety-wise, the bed is aptly equipped to make it usable without worries. Besides the reliable ladders, it comes with full-length guardrails and takes safety standards very seriously considering the CPSC certification. No annoying squeaks or creaks can be heard even when you push the weight capacity to the limit. Assembling this bed takes some effort, but two people should manage this process without too much hassle. It will probably take some time just to get every piece out of the plastic. One disadvantage of this bunk bed is the plastic clips which some people won’t like but they’re in place for a reason – to ensure the best stability of the bed. Considering the cost, Walker Edison has another strong competitor to take into account if you need a decent metal Twin-Over-Full bunk bed. Those concerned with safety will like this model a lot, but the construction does manage to balance the functionality with just the right amount of attractive looks.